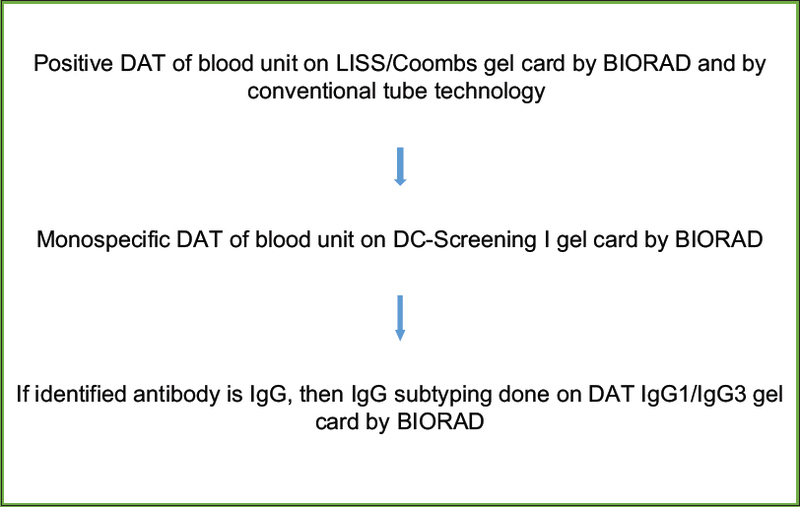 The direct antiglobulin test (DAT) is a simple test used to determine if red cells have been coated in vivo with immunoglobulin (Ig), complement, or both. The DAT is used most commonly to investigate possible hemolytic transfusion reactions, hemolytic disease of the fetus and newborn, autoimmune hemolytic anemia (AIHA), and drug-induced immune hemolysis. Donors with a positive DAT are usually identified at the time of crossmatching. In 1965, Weiner first described the occurrence of a positive DAT in hematologically healthy individuals in the United Kingdom. Although there is no evident immediate harm to a transfusion recipient in receiving red blood cells (RBCs) from a donor with a positive DAT if crossmatching can be done successfully, but facilities using an immediate spin or a computerized crossmatch would not detect this abnormality before transfusion, and so these units (including some with a strongly positive DAT) would be unknowingly transfused to the patients. Based on the documented data, there is little reason to suspect that RBCs weakly coated with IgG will have a decreased posttransfusion survival, but in case of strong positive DAT, there are reasons to worry. The study was conducted over the past 5 years from 2013 to 2017 in a tertiary care health center. All whole blood donations were tested for ABO Rh, irregular antibody, HIV, HBV, HCV, SYPHILIS, and Malaria parasite. At the time of blood/blood component request, ABO Rh, antibody screen, autocontrol, and crossmatching were done. In case antibody screen is negative and incompatible crossmatch, DAT of blood unit and the patient is done. Once DAT of the respective unit comes positive, further workup is shown in [Figure 1]. DAT workup was done by column agglutination technique on gel cards provided by DiaMed, GmbH Switzerland. Respective packed RBC is discarded. A total of 55,310 donations were collected in 5 years of which 1571 were female donors and 53,739 were male donors. Twenty-two (0.04%) donors were DAT positive and 19 (0.03%) donors were indirect Coombs test positive. Details are given in [Table 1]. The incidence of DAT positivity in our donor population was 1:2514 and the incidence of indirect antiglobulin test positivity was 1:2911. Gender-wise DAT positivity distribution is given in [Table 2]. Maximum DA-positive donors were in the age group of 30–40 (45%) years [Table 3] and were repeat donors (64%) [Table 4]. [Table 5] shows that in 72% of cases IgG alone was involved, and in 18% of cases, it was subtyped as I gG1/IgG3. Issitt and Anstee reported that of blood donors with a positive DAT and IgG coating the RBCs, 5%–10% will develop AIHA, 20%–25% will become DAT-negative over time, and 60%–70% will remain DAT positive but hematologically normal. There is evidence of a significantly increased risk of cancer, especially hematologic malignancies, among blood donors with a positive DAT, within a short follow-up period. A positive DAT thus appears to be a risk marker for malignancy. This raises the question as to whether a blood donor who may be in the early stages of a malignant process can actually transmit the illness to a transfusion recipient may be not but is it actually safe to transfuse such blood to the recipient when we are ruling out the possibility of even malaria transmission? AABB Standards for Blood Banks and Transfusion Services, 26th Ed, 2009, Section 5.2.4 states that “the medical director shall establish the means to notify all donors of any medically signifi cant abnormality detected during the predonation evaluation or as a result of laboratory testing or recipient follow-up”. We tried to recall DAT-positive donors but because of the lack of set guidelines and confusion about the referral of such donors calling them after 15–20 days after their donation (when the unit was picked up for crossmatch in first-in first-out order) was a challenge. It is unethical if we are hiding any test result run on donors' blood sample that came out to be positive from donor. In that case, are we missing out on our DAT-positive blood donor notification and if they are notified who should we refer them to and how long should they be followed up. For this, we really need more such studies to have set guidelines for including DAT in type and screen of donor unit that would prevent delay in turnaround time of crossmatching, and there should be a standardized protocol across the country to avoid confusion among the blood donors and staff dealing with them. Keeping the above scenario in mind, switching over to computerized crossmatch requires second thought or we include DAT testing as a part of predonation counseling and post-donation testing. In the present scenario, when both patients and blood donors are equally aware of their right to know about treatment plan and result of the tests performed on any of sample collected from them it becomes our duty to inform them about the same. There is a need of standardized protocols throughout the country about proper donor notification, and that can only be achieved by doing similar studies at larger platform to reach decisive conclusions. Roback JD, Combs MR, Grossman BJ, Hillyer CD. AABB Technical Manual. 16th ed. Bethesda: AABB; 2008. Weiner W. “Coombs positive” “normal” people. Bibl Haematol 1965;9:35. Judd WJ. The clinical insignificance of a positive direct antiglobulin test. In: Direct Antiglobulin Testing in the New Millennium. Bethesda: American Association of Blood Banks; 1999. Issitt PD, Anstee DJ. Applied Blood Group Serology. Canada: Montgomery Scientific Publications; 1998. p. 1015-20. Rottenberg Y, Yahalom V, Shinar E, Adler B, Paltiel O. Blood donors with a positive direct antiglobulin test are at increased risk for hematologic malignancies and cancer in general. Blood 2007;110:2903. AABB Standards for Blood Banks and Transfusion Services. 25th ed. Bethesda: America Association of Blood Banks; 2009. p. 16.